I am from Pakistan but I have a special affection towards India. Firstly, because my grand-parents belonged to India and second, because it is Indian doctors that gave me a new life. My name is Mahpara. I am student of M.Phil at University of the Punjab, Lahore. I am originally from Toba Tek Singh (Punjab, Pakistan). It is a city named after the Sikh saint Toba Tek Singh who lived here and served the poor and the needy. Both to me and my father, India and Pakistan generate similar feelings and emotions. During my childhood, I remember my grand-father listening to some songs and becoming nostalgic about the shared culture between India and Pakistan. He told me that both in India and Pakistan whenever families celebrated a happy occasion, they sang to welcome prosperity in the household. My grand-father had the habit of recording these songs so that when my Indian cousins would visit Pakistan, they could also listen to them. He often invited all our relatives and other villagers to our house whenever we hosted my Indian cousins. The entire village felt exhilarated and showered their hospitality on the Indian guests. My family always had this desire to visit India because we believe that the culture in India and Pakistan is very similar. In 2015, when my father suffered from some problems in his liver; the doctors advised us to go for a liver transplant. It was then that my father decided that he would visit India for the treatment. But the next big question that we faced was who would be the donor? I decided to step forward and donate a part of my liver to my father. It was indeed a very difficult time for me and my family. We travelled to India via the Dosti bus (The bus of friendship) which we believe is a very good initiative for the people of India and Pakistan. On the day of travel, while we were worried and anxious about my father’s health, people in the bus cheered us up and were very cooperative. 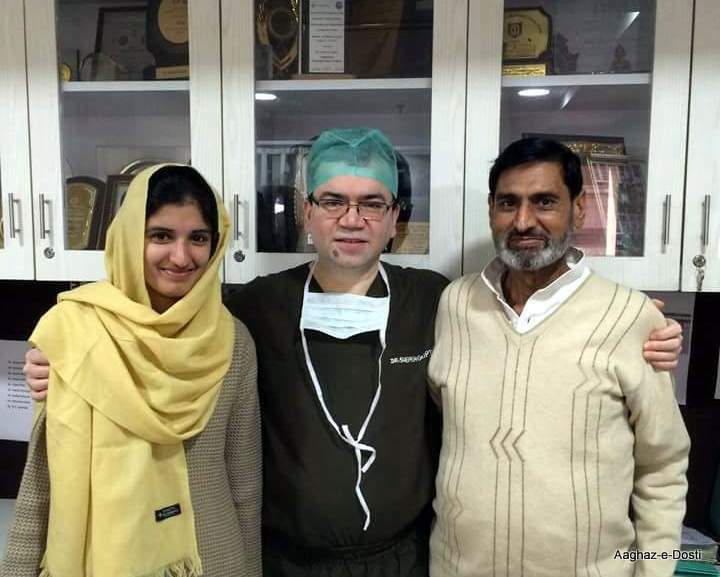 In Delhi, my father was treated by Dr. Subhash Gupta from the Indraprastha Apollo Hospital. Under his care, we felt relaxed and comfortable. Our belief in God and Dr. Gupta’s care encouraged my father as well. The transplant was done on 10th November, 2015 post which we stayed in Delhi for 2 months and 10 days. That was the happiest day for my family. 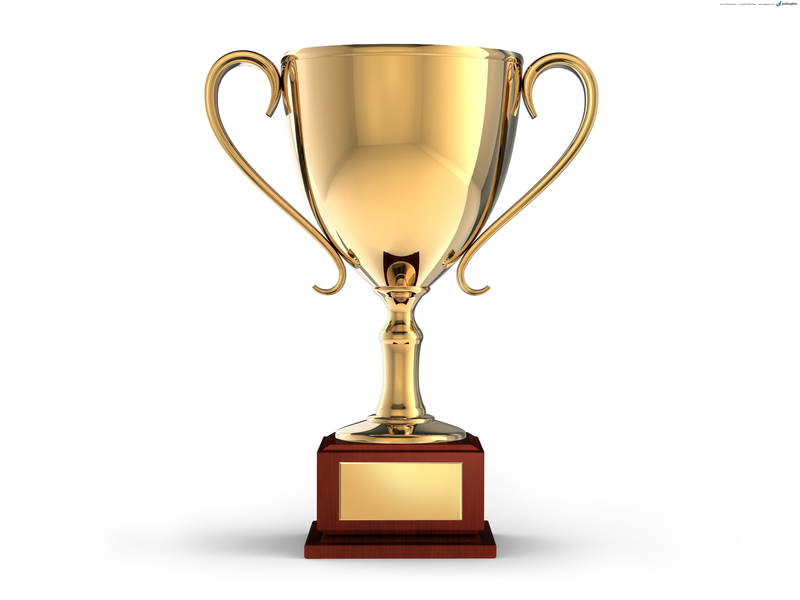 Dr. Gupta’s entire team was extremely supportive and caring. I believe they have magic in their hands. They are angels; nothing less than God’s blessings to mankind. We visited Indian again in 2016 for the follow-up treatment and ended up staying there for more than a month. Certainly, the common people of both nations love each other and have feelings of concern and a ffection for the ‘other’. During both the visits, all I received from Indians was love and care. They are delighted when they meet someone from Pakistan and are curious to learn about Pakistani culture and lifestyle. Why would the common man wish for war and hatred? We are all the same and we should not be fighting with one another. Instead, we should be fighting to achieve peace. What sets us apart is that we live on different sides but that should not come in the way of our love for each other. My wish is that someday I want to visit my grand-father’s village in India. My message to Indians and Pakistanis is: love not only your country, but also love the ‘other’. Pray and work for peace between India and Pakistan so that we can sow the seeds of happiness and laughter. Let smiles be infectious and cross borders. Because “Jaisa Desh hai tera, waisa Desh hai mera” (As is your country, so is mine; we are in fact so similar). 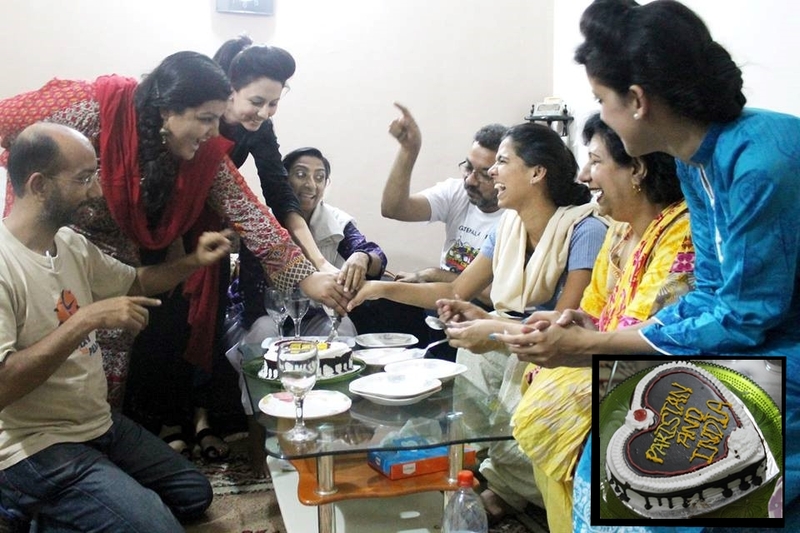 Mahpara is an M.Phil student (Gender Studies) at University of the Punjab, Lahore. She aims to be a changemaker, especially by challenging stereotypes regarding women. She is at the helm of a campaign promoting education for girls in Toba Tek Singh. She also volunteers for MASHAL, an organization that works towards developing alternatives for human empowerment by facilitating communication between communities. I was on cloud nine when I learnt that I had been selected for the Global Youth Peace Festival (GYPF) to be held in Chandigarh, India from September 28 to October 2, 2015. 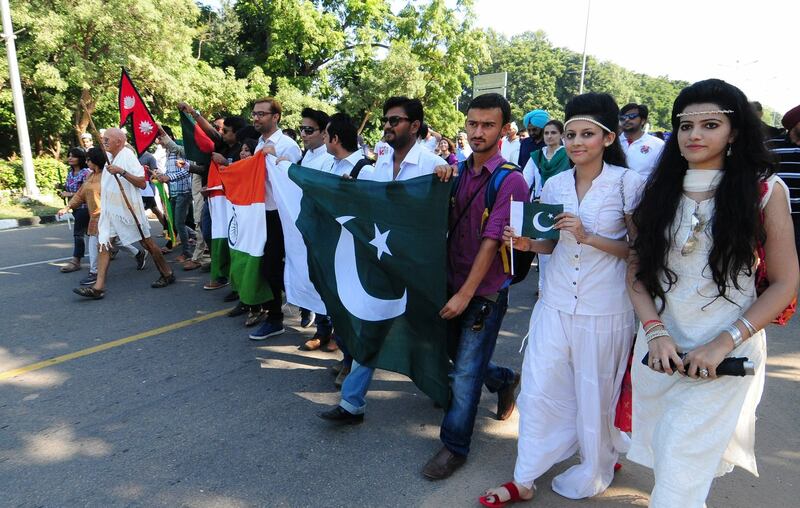 I was quite thrilled to be representing my country Pakistan at GYPF and working for peace between India and Pakistan. When I applied for a visa it was quite late, and I felt like I may not be able to visit India. As I waited anxiously, I still didn’t lose hope. My bags were packed, I was all set and my moral was high. While few of my friends congratulated me on my selection in GYPF, there were some who reacted strangely. I was asked questions like how and why I was visiting India, was it safe to visit etc. A few days later, we received the news about our visa application being accepted and here we were … all set to travel to India. When I visited the Indian Embassy in Islamabad with my friends Raj and Irfan, I was quite impressed with their cooperative behaviour. During our journey to India, we were joined by other friends from Lahore and Karachi. 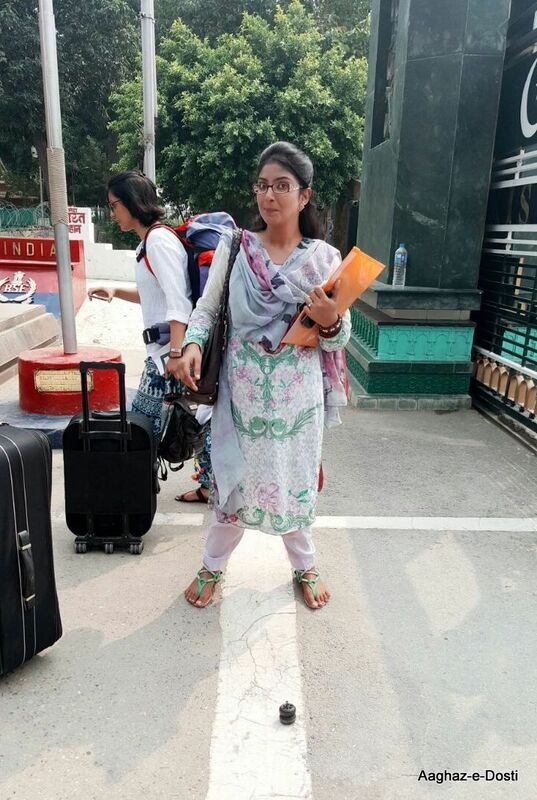 Upon reaching the Wagah border, we underwent the process of immigration and crossed the border on foot. As I put my foot on Indian land, I felt as if I had just arrived at my home from another home (Pakistan). Upon our arrival, we were received by some GYPF members and then we travelled to Chandigarh along with them. Not for one moment, I had a feeling that I was in a different country. Only the names of people and the food we ate seemed a bit different. I had already started craving for non-vegetarian food. As we reached Chandigarh to be a part of GYPF, we were welcome with Dhol (traditional Indian musical instrument, typically used in weddings to welcome guests) and Bhangra (traditional dance form of the state of Punjab in India). GYPF gave us the opportunity to meet people from different countries. The event saw the presence of participants from about 30 countries. Over the years, GYPF has made its mark as an annual gathering of young people from all over the world who want to contribute positively to peace building. 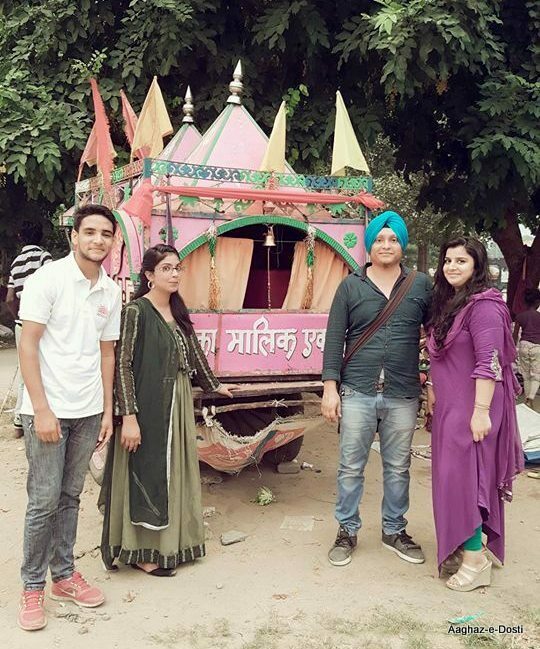 On the third day of GYPF, we went and visited a few villages around Chandigarh. What I observed that life there is much similar to the villages in Pakistan. During my stay in India, I made many Indian friends and found them to be very supportive. From Chandigarh, we travelled to Delhi and it was quite an amazing journey. 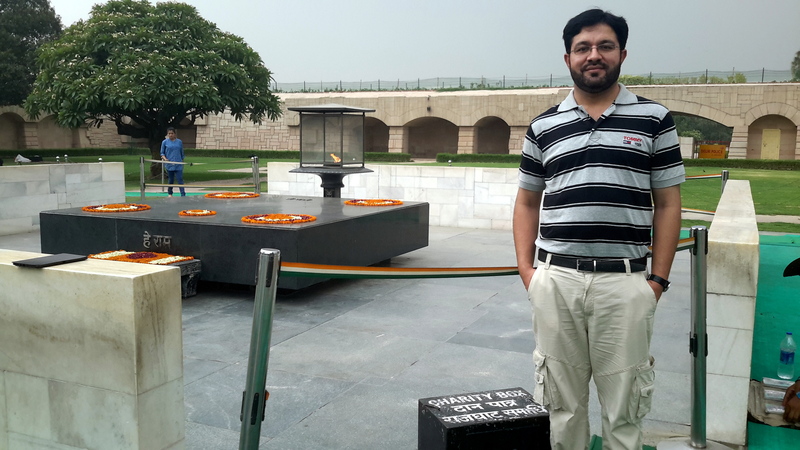 In Delhi, we stayed at Rajghat and visited many places such as Chandni Chowk and India Gate. We also enjoyed the unique services of Metro rail and Green buses. This was also an opp ortunity for me to meet and interact with many members from AED’s India team. I was fortunate to meet Devika, Madhuri and Ali, all of whom have inspired me to think differently and work for peace. I am equally grateful to Pramod ji, his family and the team of Yuvsatta which managed this program. Through our participation in the program, we have been able to convey to the world the message of peace supported by each and every Pakistani and also show the humane side of Pakistan to the world. After Delhi, we went to Amritsar and crossed the Wagah border on foot to reach Pakistan. This trip to India will be etched forever in my memory and my heart. Syed Zeeshan Ali Shah is from Chitral. 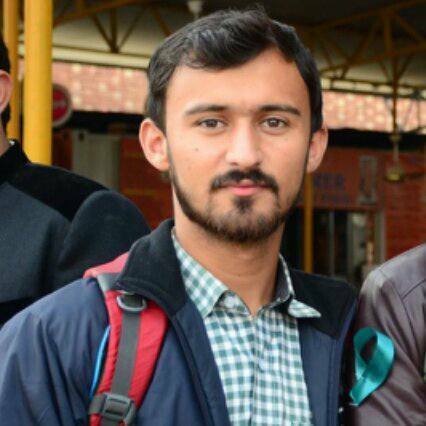 He is doing software engineering from COMSATS, Islamabad. 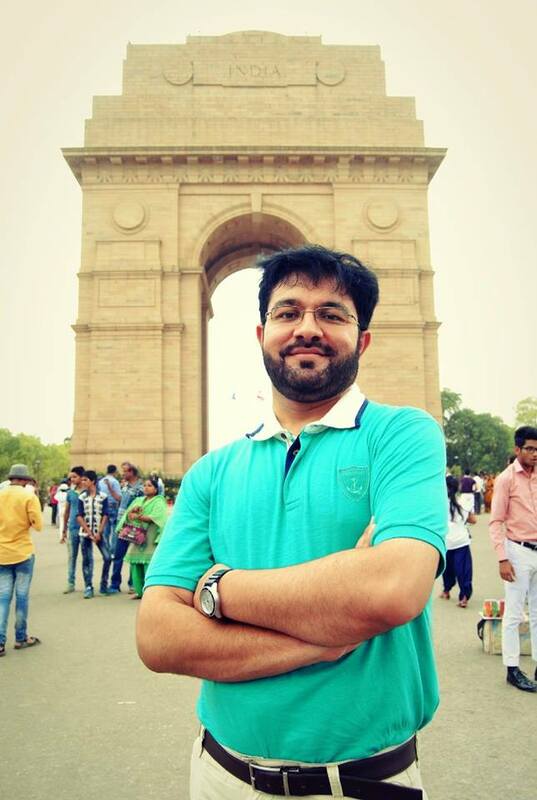 He is a member of Islamabad Chapter of Aaghaz-e- Dosti, an Indo-Pak Friendship Initiative. I have travelled to some countries and being a social person, I have Pakistani friends studying or working in many countries. What has been common amongst many of my friends is that either they have an Indian housemate, or their best friend is an Indian. Therefore, I already felt that Indians were similar to us, and had a desire to visit India. One of my biggest dreams was to visit the Taj Mahal, and Amritsar, from where my grandparents had migrated. Amritsar is just 50 kms away from my home in Pakistan but it was difficult for me to go there due to visa issues. All the foreign travelers coming from Europe and the US whom I met in Pakistan used to cross the border into India with ease, but I was unable to do the same despite being so close geographically. It was a true example of “So near yet so far”. 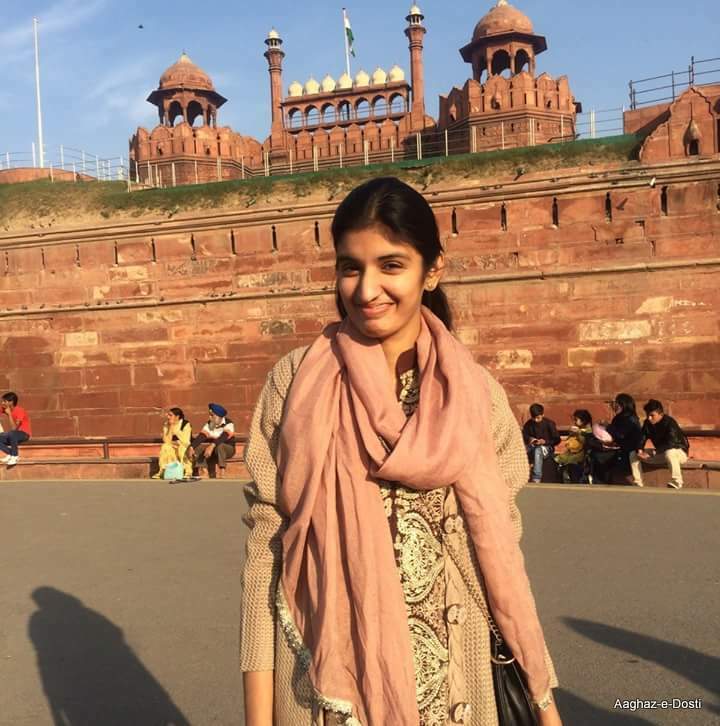 Even though I had already met a number of Indians while travelling around the world, and many of them became my friends, I was still a little worried about how ordinary Indians would react during my visit to India when they realize I was from Pakistan. All of my friends and relatives were worried for me. All my friends to whom I extended an invitation to join me said, “Marna hai? Sari zindagi Indian jail main guzarni hai? Tu pagal hai, hum pagal nahi hein” (Do you think I want to get myself killed? Do you want to spend the rest of your life in an Indian prison? You must be mad, we aren’t). I hadn’t imagined that what was waiting for me was the friendliest visit I had ever experienced. I started getting an idea of the same even before landing in India. I use a website called ‘couchsurfing’ to find hosts in the cities I travel to. You can meet or stay at someone’s home for free with the help of this website. This community is all over the world, and its purpose is cultural exchange and to help people who are travelling on a budget to find a homestay. Usually, it is a bit difficult to find a host for a South Asian or a Middle Eastern guy. One may have to send requests to dozens of people to find a host. However, I was surprised that just after posting a public post about my impending trip and before sending requests to individuals, I started receiving a bunch of invitations from Delhi, Kolkata and Chandigarh. There were so many people who were interested in meeting or hosting me. This was just the beginning. I was already late and had missed Pakistan and Bangladesh’s match. It was Pakistan vs. India the following day and I received a call from FedEx that my passport had reached Lahore. 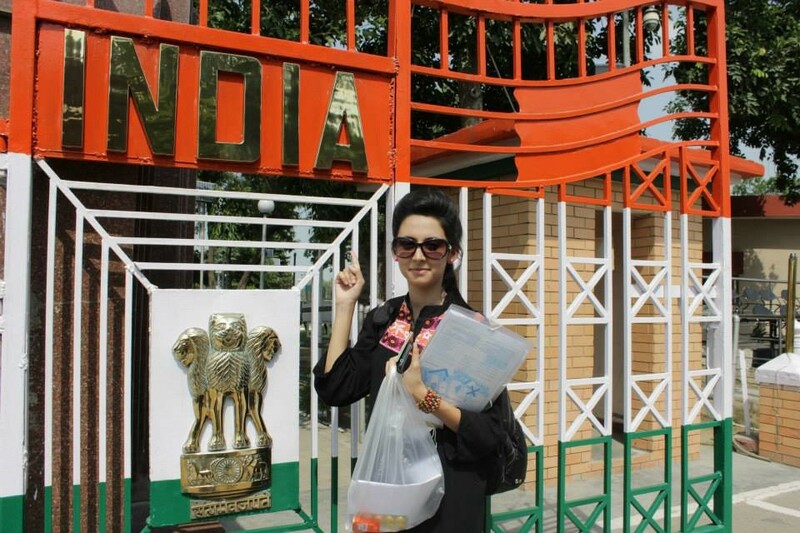 I picked up my passport, came back home to pack my bag in 15 minutes and headed straight to Wagah border which is just a 20-minute drive from my home. As I crossed the border in the afternoon, it was already time for the flag ceremony a lot of spectators had gathered for it. It felt different being in a new country. However, there was no difference in terms of culture: similar people, the same language and same surroundings. As I reached the immigration counter, I was pleasantly surprised to see the immigration officer listening to Nusrat Fateh Ali Khan’s qawwalis. While he was entering the details of my documents in the system, we kept talking to each other in Punjabi. He told me that almost every Indian Punjabi guy is a fan of Pakistani stage dramas and many Indian women like to watch Pakistani dramas on Zindagi channel. Then I went to customs and as soon as they got to know that I had come for the T20 World Cup, they started discussing cricket with me. Being a talkative person myself, the discussion on cricket continued for the next 30 minutes. My next destination was Amritsar railway station. 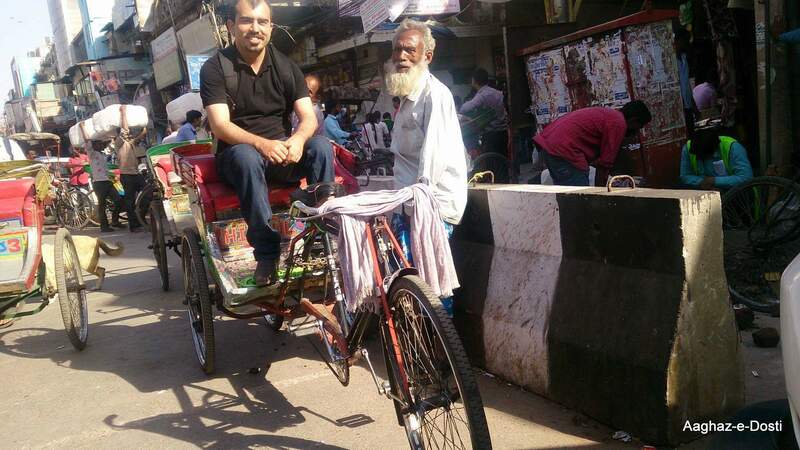 When the rickshaw riders learned that I was from Pakistan and that my grandparents had migrated from the same city in 1947, they offered me a free ride to show me around the famous places of Amritsar. 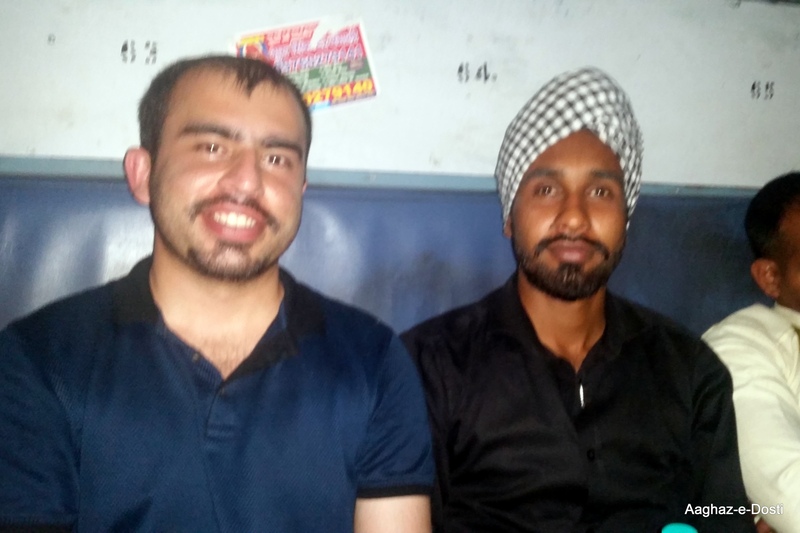 Later while I was looking to buy a train ticket for Delhi, I bumped into two Sikh brothers who were looking for the same. They asked me if I was from Delhi. When I told them I was from Pakistan, they initially didn’t believe me. But then they invited me to join their family. Their parents were also very happy to meet me and within a few minutes they started treating me like I was a part of their family. The entire family looked after me until they got off the train near Delhi, making space for me and my luggage in the crowded train, sharing food and lots of stories with me. By the time that eight hour train ride ended, I had made many other friends as well. So, this was my first half day in India and I already knew that the next couple of weeks would be a lot of fun. I met hundreds of people during the next fortnight and experienced a lot but I would share some of the stories as sharing all of them would need an entire book. As I could not make it to Kolkata for the Pakistan vs. India men’s match, I decided to go for Pakistan vs. India women’s match at Feroz Shah Kotla stadium in Delhi. My faint hearted mother, who gets worried even when I go from Lahore to Islamabad, had pleaded that when in India, I shouldn’t walk around wearing Pakistan’s jersey. Being the obedient son that I am, I followed what she said and wore another tee over my Pakistani jersey. As I was looking for the entrance gate, I met an Indian fan Arifuddin Ahmed and we started talking to each other. When he asked me which city I was from, I told him Lahore and was again met with disbelief. When he did decide to believe that I was indeed in fact from Pakistan, we became friends. I reached my stand and as I sat on my seat, I realized that I was the only Pakistani fan between thousands of Indian fans. After a few minutes, I removed the tee I was wearing over my Pakistani jersey and brought out my Pakistani flag from the bag. The guy sitting next to me, who had all his attention at the match, noticed after a couple of minutes that I was wearing a Pakistani jersey. He asked me if I was from Pakistan and when he learned that I was from Lahore, was happy and welcomed me, asking some questions about Lahore with a lot of curiosity. Then more and more people started to realize that there was a Pakistani between them and happily greeted me. When India’s innings finished, I started walking around and a few people started to talk and take pictures with me and Pakistan’s flag. Soon, there were hundreds of people around me, taking pictures with me. 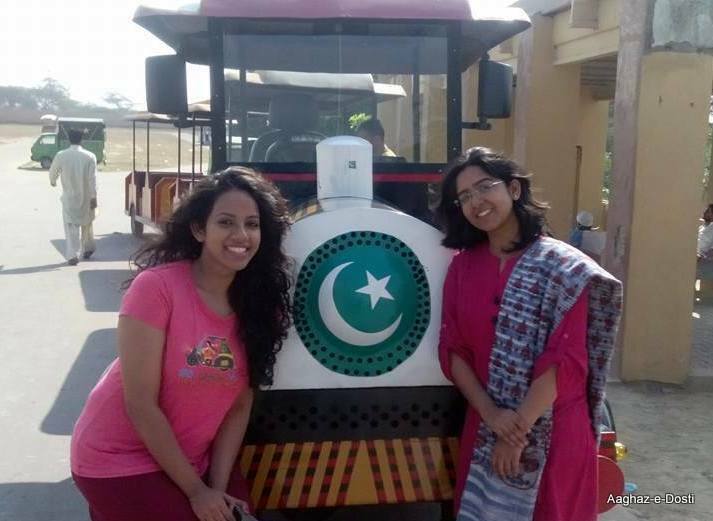 The most surprising thing was they were borrowing the Pakistani flag from me to take pictures with it. Pakistan won on the match and many people congratulated me. Delhi and Lahore have so much in common, they are truly two sister cities. Lahore has Shahi Qila while Delhi has Lal Qila; Lahore has Badshahi Masjid and Delhi has Jama Masjid; Lahore has Delhi Gate while Delhi has Lahore Gate; Lahore has Jahangir’s tomb while Delhi has Humayun’s tomb; Lahore has Shalimar Gardens and Delhi has Qutb Minar. Old Lahore and Old Delhi look so similar. The language and food are also quite similar and if one walks the streets, one will notice during street fights that even the abuses are the same! 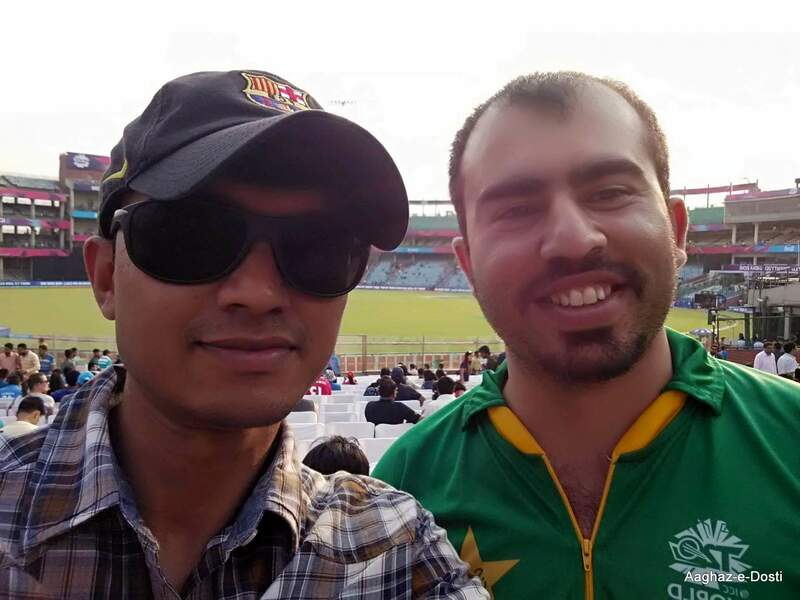 After a couple of days, I went to Chandigarh to watch Pakistani men play New Zealand. 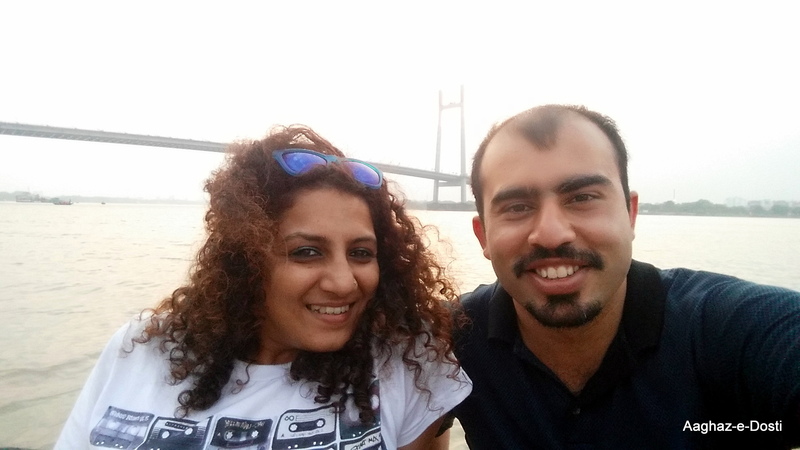 I met a Pakistani guy there and we decided to see Mohali and Chandigarh together. 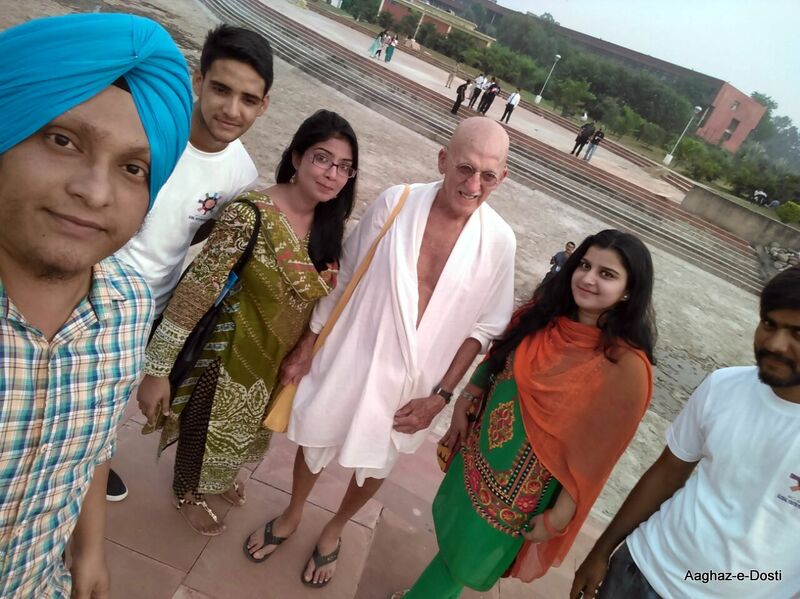 We took a shared rickshaw to go from Mohali’s Sikh museum to Chandigarh’s rock garden. The driver didn’t have change and we were short of Rs. 10. When we were unable to find any other solution, I offered him 20 Pakistani rupees. First he thought that I was an Indian and was just joking, asking me what he would do with Pakistani currency. I asked him he could go to the currency exchange and get Indian notes. I was taken aback by his response when I showed him Pakistani currency and told him that I was from Pakistan and that I came here to watch cricket. These were his words, “I won’t get this note exchanged. I will show this to my children. I will keep this with me all my life as this has come from Pakistan.” We had to change the rickshaw before entering Chandigarh premises as diesel rickshaws are not allowed there. He stopped a new rickshaw and bargained for us with the driver, telling them that we were his brothers. I had gained enough confidence now that I had started to walk around in Pakistan’s jersey. I went to Pakistani and Bangladeshi women’s match after a few days in Delhi. As I was looking for an auto rickshaw after the match, two auto drivers started quarrelling with each other for the rider like it happens in Pakistan. As I was wearing Pakistan’s jersey, a senior policeman came out from a departing police bus thinking that there was some trouble. He approached me and asked if everything was alright. As I told him everything was fine, he told one of the drivers to take me to the place I wanted to go to, and took down his vehicle’s registration number, to make sure that I didn’t face any problem due to my jersey. I thanked him to which he replied that I was not just his country’s guest, I was like his younger brother. 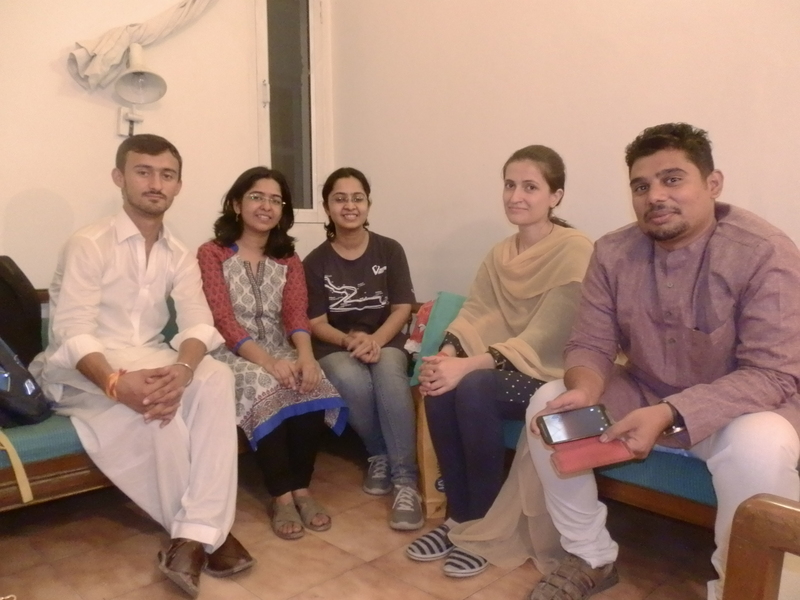 I met so many other people in Delhi and Kolkata through couchsurfing, who showed me around, invited me to their homes for dinner, and introduced me to their families and friends. I made such good friends in Kolkata, who looked after me and then gave some gifts including traditional foods from Bengal for my family. I really wanted to watch a match at Eden Gardens, so my couchsurfer friend Richa said she would try to get me a ticket for Bangladesh and New Zealand’s match. She mentioned in her social circle that she was looking for a ticket for her Pakistani guest and within 30 minutes a friend of hers offered a ticket as a gift. Sharad, another friend I made through couchsurfing in Kolkata, invited me to his home for breakfast and dinner every day. As his grandparents had migrated from Sialkot, his parents could speak Punjabi and it felt like home at his place. Each time they prepared almost a dozen dishes, especially from Bengal. I was also able to meet some Indian friends I had made in Australia. They left their commitments and came to meet me, showing me around and taking me to dinners. Those were such happy moments, those people whom I had first met in Australia were meeting me now in India but what was common was that both times, I was the one who was travelling so they hosted me graciously. I came back to Lahore on the 15th day which was also the last day of my visa. I made so many lifelong friends and memories during this trip. I would love to visit India again to meet my friends and see more of India. With all this, I realized that ordinary people of Pakistan and India are eager to get to know each other, and feel very happy when they meet someone who has come from across the border. We can eliminate so many misunderstandings if only people to people contact can be increased. 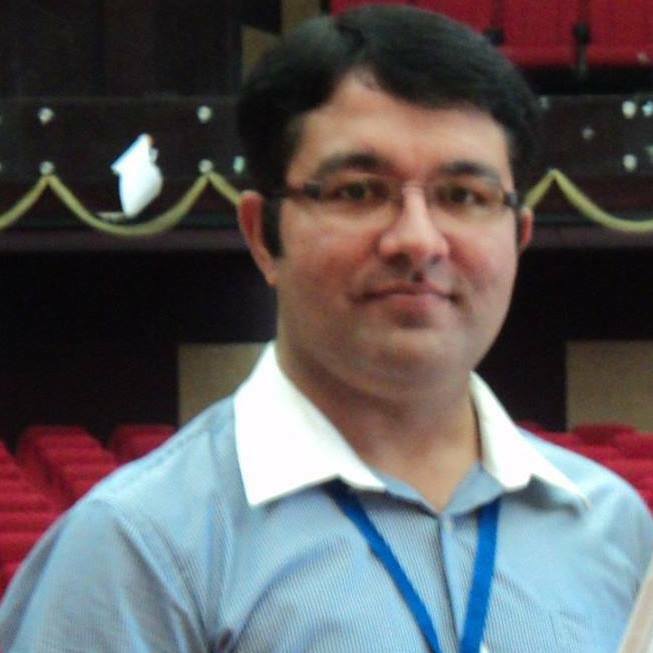 Talha Asif Dar has done MBA from Bahria University, Islamabad. After doing a 9 to 6 job for a couple of years, he decided to quit that and start travelling. He is a crazy sports fan and travels the world to attend sports events, and starts backpacking once the event ends. 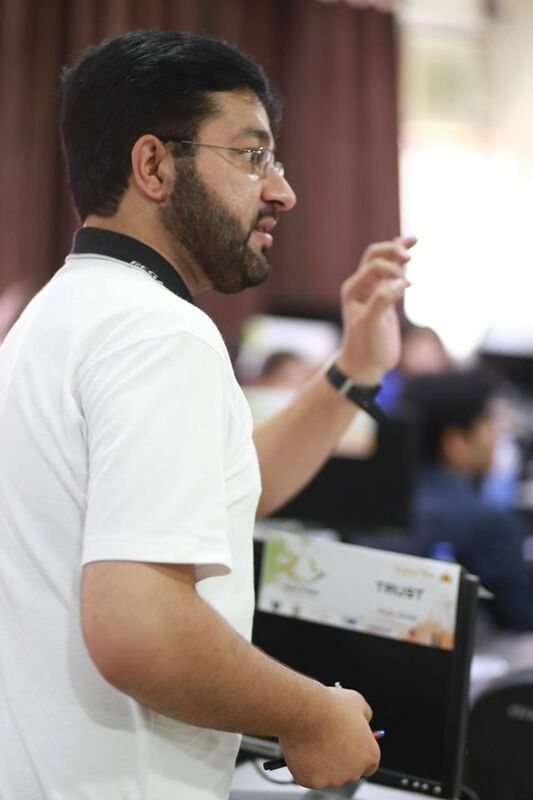 Talha does freelance work to support himself and his travelling. One of his biggest wishes is to see peace between Pakistan and India. The relations between Pakistan and India have been subjected to strains by numerous political dilemmas and conflicts of history and present that include the Partition of British India in 1947, the Kashmir dispute and the many military conflicts which have been fought between the two States. These two States of South Asia share historic, cultural, geographic and economic links but unfortunately their relationship has always been filled with hostility and doubt. Peace between these two States seems nearly impossible on political level but the ground realities are very different from this common and popular perception. Being selected for the Global Youth Peace Fest – 2016 hosted by Yuvsatta was the first step towards my childhood dream to visit India. I was so excited to explore something new, things that I had been watching only on the TV screens. 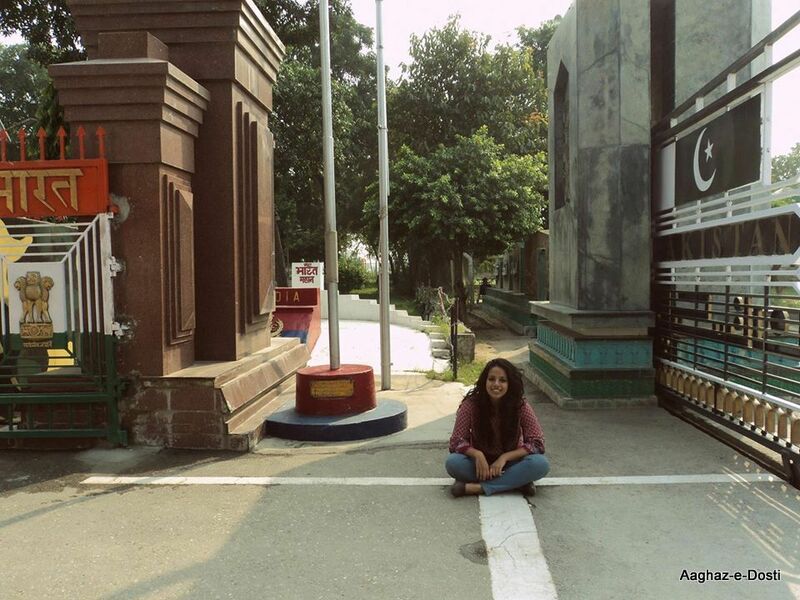 But on crossing the Wagha Border, my excitement couldn’t stay longer as I didn’t find anything new beyond that Line. Same air, sun, land, faces, language, dresses and even love! So I realized that we are recognizably similar, equally welcoming and extremely hospitable. From the Indian Immigration office (Attari) to the Conference venue (Chandigarh and Shimla), I had interacted with people from the Military, Police and with Civilians and found that humanity and peace is the priority on both sides of the white line (border). I had landed in India when the subcontinent was suffering in a war-frenzy environment. It was a highly intense political situation of Indo-Pak and jingoism was at it’s peak in both countries. But the security given by our host as well as the cooperation and love of the volunteers made us smile even in such times. Infact, the security, the protocol as well as the media attention to the Pakistanis made other country delegations jealous of our relation! Throughout these seven days of my trip, I developed memories that are going to last forever. Some of my memories of my India Diaries are the visit to Rock Garden, Sukhna Lake, Sector 36, Sector 17, Market Sector 22, Elante Mall, Piccadilly Cinema, Chandigarh Institute of Hotel Management, Gurukul Global School – Chandigarh, Dev Samaj College, the beauty of Haveli Restaurant Jalandhar, Mandirs, Gurdwaras, the amazing Christ Church Shimla and the great Shimla Mall. When I remember my Indian travel, I can never miss out on the yummy food – Pani Puri (Gol Gappe), Momos, Vada Pav, Pao Bhaji, Palak Paneer, Lassi, Chholy Pathoory! I had never experienced such a variety of Vegetarian food before. There is too much to experience and explore in the India so I hope to revisit this country as I feel that war, hatred and bloodshed will never let the establishment of peace in the subcontinent. During my visit to India, I met enemies who were hospitable and loving! I never knew that enemies could be this way! If those that I met were enemies, then I wonder how friends would be like. So let politics guide us, not rule us! Urwah Sultana is a Lahore-based social activist. 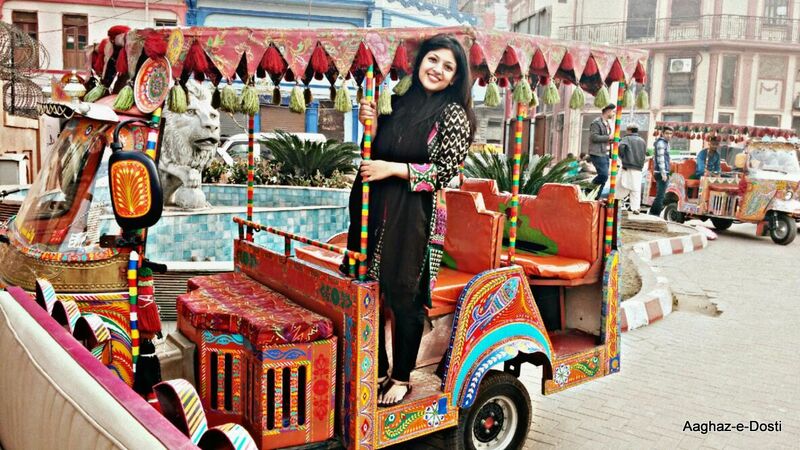 She recently graduated from Punjab University in Social & Cultural Sciences and is currently working with Voice Society for Rehabilitation of the Special Persons. She is also an ambassador at the Women Leadership Program of Career Buzz Pakistan. Whenever we think of foreign travel, one thing which makes foreign ‘foreign’ is the cultural difference. While travelling to a foreign land we expect to see different lifestyles, cultural practices, norms, clothing, food habits and values. Whether one would like to call it my fortune or misfortune, my first foreign trip was to a country that was similar to mine, in November 2015, when I visited Pakistan to present a paper at a conference. It felt like visiting a second home. As I am a peace activist, I had already been able to shed a lot of the stereotypes that people in India hold about Pakistan. Despite the excitement of being able to visit neighbors, I was unable to shake off that little anxiety I felt while crossing the Wagha border. I harboured anxiety about visiting an Islamic country which is known as the epicentre of terrorism, where bomb blasts are a routine and women are rarely seen outside the burqa. What I experienced, on the other hand, couldn’t have been more contradicting. During my six day stay, I did not realize I was in another country. Lahore filled me with a homely feeling, the same that I experience in Delhi. We crossed the Wagha border on foot and I found the immigration process to be smoother than the visa process. We met people who applauded the courage of two Indian women travelling to Pakistan all by themselves and also those who couldn’t stop discouraging us. 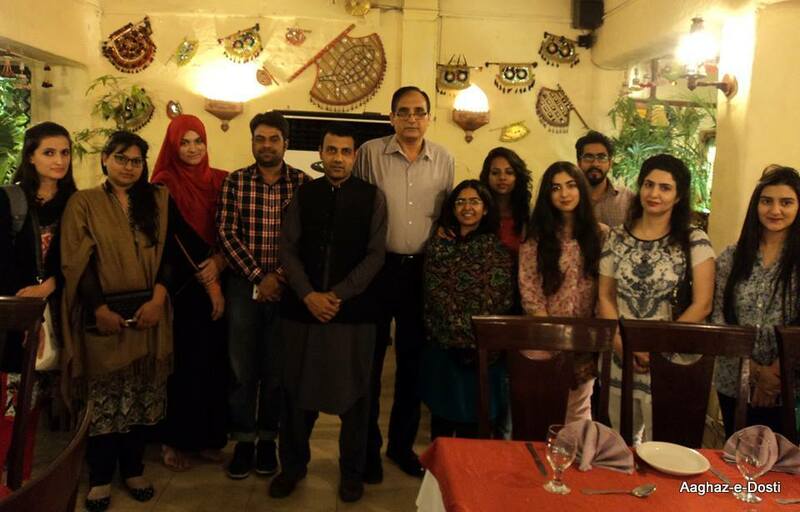 Our hosts picked us up from the border and showed us around Lahore before leaving us at the UMT (University of Management and Technology) guest house. The rest of the evening was spent enjoying Dholki (a pre-wedding ceremony common in South Asian weddings) at a friend’s place and humming Punjabi folk songs. Next three days, we attended a conference, whose overarching theme was inclusive education. The moderator introduced us to the audience with a quote by Gandhi after which Devika Mittal and I presented our paper titled Attempting Inclusive Elementary Education in India: How Far Have We Come With RTE (Right to Education)? Presenting a paper on inclusive education in Pakistan will always be a special experience for me because the university where we spoke definitely practised what they preached: it had excellent facilities for visually challenged students; ranging from audio guides to Braille. Students were excited to meet and talk to us. We were floored by the display of graciousness by our hosts who left no stone unturned in making us feel comfortable. Their hospitable gesture was evident when they ensured that food for us was cooked separately considering the fact that we are vegetarians. I also encountered people who are inspired by progressive policies of the Indian government. This enabled me to learn about that facet of Pakistanis which we as Indians rarely know. There are people in Pakistan who do not blame India for everything that is wrong with their country, but are willing to learn from good aspects of Indian society and governance. This strengthened my belief in the peace process. The fact is that not all Pakistanis hate Indians and India could do well to lead by example. One major irritant of course was the constant watch being kept on us (which is normal in the case of Indians traveling to Pakistan and vice versa) and restrictions imposed on moving out of the campus. We roamed about the city once the conference ended. A visit to Punjab University exposed me to another side of Pakistan and I ended up questioning many things such as separate canteens for men and women, separate lifts and curtailment on mixing up of opposite genders. At the same time, during an evening visit to the National College of Arts, I got to witness a more liberal side of Pakistan with men and women hanging out together, practicing theatre, working on a piece of art or spending relaxed time together in a group. I have met many Indians who had the opportunity to visit Pakistan and on their return they gushed about the great hospitality accorded to them. For me, Pakistan was a lot like India, and this extends to the oxymoronic, complicated juxtaposition back home where parochial thinking, great hospitality, respect and stereotypes all co-exist. One early morning, I experienced a sexually lewd comment inside Babri Masjid. But what resonated within me for a long time was the fact that I was dressed like a Lahori that day, and I know I was assumed to be one when the comment was made. I believe that a person’s true nature can be judged from how he/she treats his/her own fellow citizens—that morning, they treated me as they would treat a Lahori early morning at Babri Masjid, and that treatment was not of great hospitality. Experiences like this only reinforce the fact that Pakistan is not too far apart from the cultural juxtaposition of our own country, and in ways more than one, Pakistan reminded me of home. The trip has ended but the memories will be cherished. I hadn’t even come back to India and I was already hoping to visit Pakistan again. 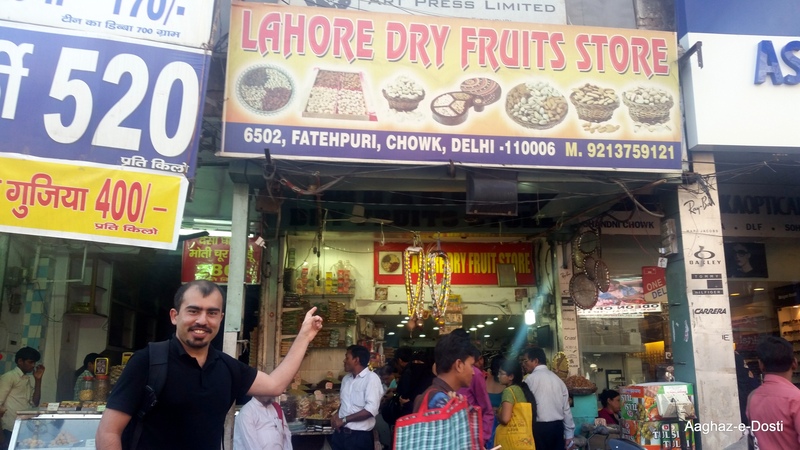 My trip ended in complete Bollywood style–breakfast in Lahore, lunch in Amritsar, next breakfast in Delhi and the breakfast after that in Bangalore. From bhai chalenge aap to bhayia chalo to Anna, electronic city, the ride from Delhi to Lahore was a roller coaster! 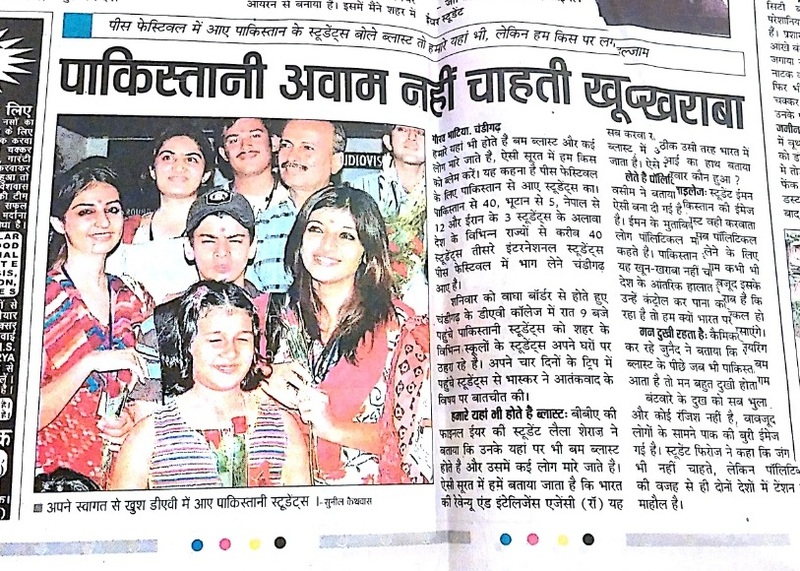 This article was edited by Dr. Nidhi Shendurnikar Tere, Baroda Co-ordinator of Aaghaz-e-Dosti. Madhavi Bansal is currently pursuing M.A. Public Policy and Governance from Azim Premji University in Bangalore. She is a peace enthusiast, who when not dancing, would be travelling. The one who has witnessed violence appreciates the value of peace. This is my story. I belong to the Khyber Pakhtunkhwa province in the northwestern region of Pakistan. Our region has been affected by the worst spate of violence since 2001. From suicide bombings to unmanned drone attacks in tribal areas, we are at the centre stage of global attention due to proximity with Afghanistan. While Pakhtuns were getting killed, they were also being suspected of perpetrating the violence. On the first day of January 2010, as I woke up, I came across a full page advertisement in the The News International (a very renowned newspaper in Pakistan). It gave me goosebumps! I left what I was doing and switched on my computer to check for the website of Aman ki Asha (Hope for Peace). I got through its Facebook page and began reading comments and feedback that were posted on it. It felt like the beginning of a new phase in my life. Toward something that I had always been pining and praying for … PEACE! I am fond of connecting with new people from across the globe, being friends with them, learning about their lives and culture. The social media has been a great medium enabling me to do so. It has helped me connect with people from across the border and work to promote peace between India and Pakistan. For the past six years, I have used my social media connections to make friends in India. I dream of a strong political, social, cultural and economic bond between the SAARC nations. If France & Germany with all their bitterness can become a part of the European Union (EU) why can’t India & Pakistan take a step forward to a SAARC Union? Earlier, I did not have any friend from India. Then I befriended Mohit Mehta and we started discussing ideas to promote peace between the two countries. We were able to discover common ground on many issues. This gave a kick start to my building ever lasting friendships with Indians. Mohit introduced me to his college buddy and neighbor Harpreet Singh. I was also fortunate to be introduced to Pramod Sharma who organizes peace festival every year in India where youth from across the globe get the opportunity to participate. I have been lucky to visit India quite a few times. The gush of emotions one experiences while crossing the border is beyond any explanation. The love extended by people on the other side of the border is remarkable. I felt I was home. There is a welcoming warmth, hospitality and a bond of love that unites citizens on both sides. It is an inexplicable feeling! My each visit to India has me given me fond memories. We, Indians and Pakistanis, share many commonalities in terms of lifestyle and our love for food. We are separated only by a piece of land. So much about us is similar. If both the nations come and strive together in agriculture, trade, education, science, sports, information technology and other areas, we can in fact become global leaders and influencers. Why are we fighting each other? Our enemies are unemployment, illiteracy, poverty and other grave threats that haunt the w orld. Cooperation on every front can lead us to growing in unison, saving billions of dollars that we right now end up spending on arms and ammunitions to guard ourselves against the ‘other’. To me this so called ‘rivalry’ between India and Pakistan seems hyped by the media. We need to understand each other and stop living in the past. Communication is the key to resolve tensions between the two countries. I believe that the media has a significant role to play in promoting peace as better and open communication channels can facilitate acceptance for each other. If employed positively, social media can be a great tool to bridge the rift. Let us get ourselves out of this ‘me-better-than-you game. It is time we stop wearing wounds as badges of honor, or as reminders of retribution. The process of healing has to begin somewhere. Now is the time and this is the place! Thinking of each other as enemies will hinder us from moving forward. Let us stop inflicting pain on each other. ‘Forgive and Forget’, ‘Accept & Embrace’ … let this be the new motto for peaceful living between India and Pakistan as also South Asia. Wishing every Indian & Pakistani a very Happy Independence Day 2016! You never know when your dreams come true, when you finally achieve something that you thought would never become a reality. Each time I go there, I see a big barrier, a big gate of steel. I never thought I would walk through it. June 2, 2016 was the day when I finally crossed that fence. Today, as I look back, I cannot imagine how I stepped into a new land, looking for new hopes, and gearing to the new experience that I was going to embrace. Before my visit to India, I believed that Indians don’t like Pakistanis. We do have so much in common, but such negative perceptions have aggravated the conflict. We stress so much on what divides us, rather than what unites us! 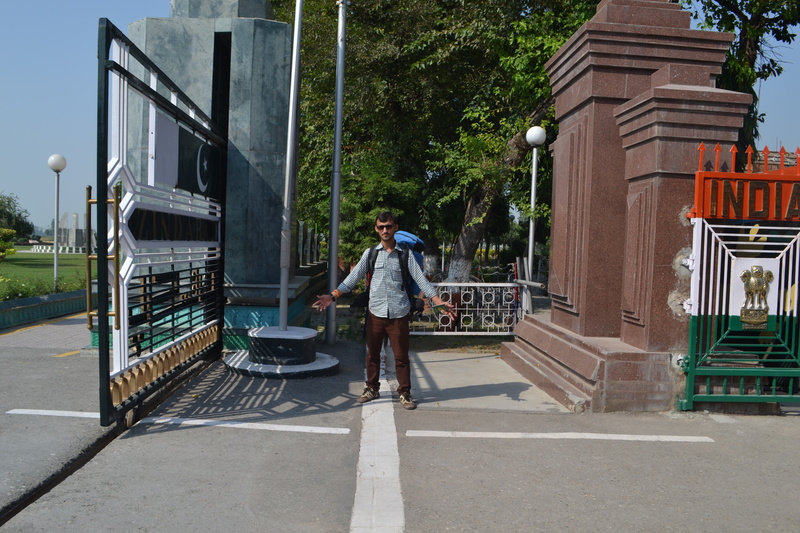 My journey began by crossing the ‘Wagah’ border. For me, the feeling was unbelievable. I still recall the visible happiness on each one’s face as we crossed over into India. 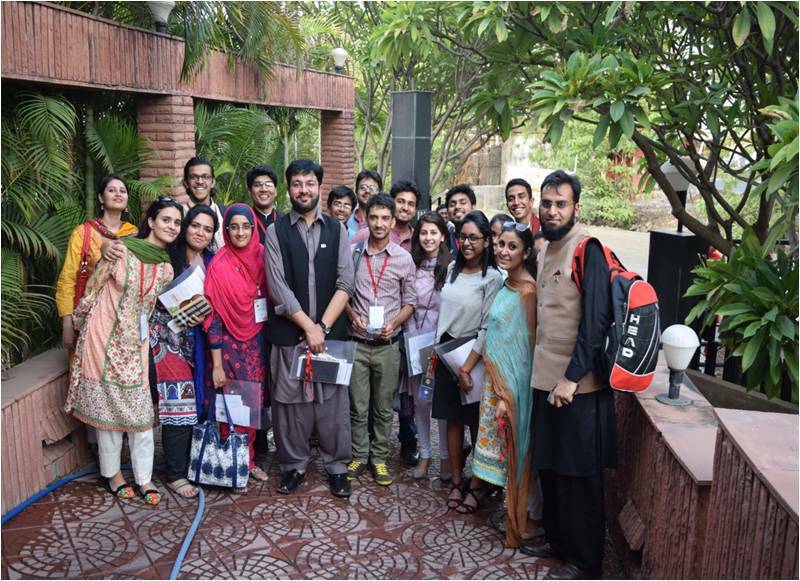 12 Pakistanis were going to represent their country in India as part of Aman ki Asha’s Model United Nations (MUN) held in Nagpur. Prior to our departure to India, every one of our friends and family cautioned us and told us to “BE SAFE”. This got me worried and nervous! Until I had crossed the border, I kept thinking about how I had to ensure my own safety. As I completed formalities with the Indian Customs Office, my worries vanished since their good and welcome demeanor gave me confidence. I started noticing a slight change in my perceptions from that very moment. 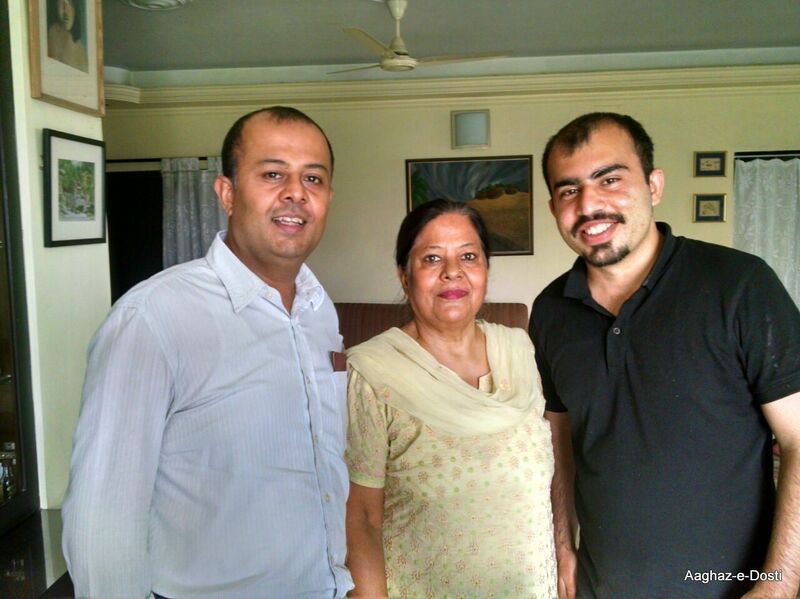 We were received by Sanchit Seth who was a part of team ‘Aman ki Asha’ the previous year. He accorded a warm welcome to us and on our way to Haveli we sang a lot of songs. I noticed how similar India is to Pakistan. Roads, buildings, the surroundings felt so familiar to me. I didn’t realize I had actually crossed the border and was now in a different country. One thing that was different from what I have seen in Pakistan is that Indian women are commonly seen driving vehicles. I have watched many Indian movies and was very excited to witness the same things in real life. After a delicious lunch at Haveli, we headed towards Delhi from where we had to take the train to Nagpur. Upon reaching Delhi at around 9 pm, we met Devang Shah who was leading the MUN event. He seemed very determined, enthusiastic, passionate and a visionary to help build peace between India and Pakistan. I felt very inspired as I met him. Post dinner we had to wait for four hours for the train to Nagpur. We also met Devang’s friend Mayank Karnani who is part of the executive board of the Aman ki Asha council. He spoke about his passion to strive for South Asian unity and development. On our way to Nagpur, we interacted with different Indian passengers and upon observation, I concluded that people are not bad, neither are their thoughts bad. It is media reportage that creates hateful perceptions about the ‘other’. We reached Nagpur around eight in the evening where we welcomed in the traditional Indian way by the organizing team of MUN. Through the traditional welcome of applying ‘tika’ (a symbol of welcome) on our foreheads, I thought that they were welcoming to be a part of their culture. The conference was held at Yeshwantrao Chavan College of Engineering and it commenced on June 4, 2016. The ceremony was formally inaugurated by the Mayor of Nagpur city and Rutwik Joshi, the Secretary General of the conference. Post this; we headed towards the debate platform. There were 12 delegates from Pakistan and 6 from India along with co-chairs who facilitated the debate. We debated on ‘Combating Terrorism in South Asia’. The co-chairs from India and Pakistan were Devang Shah and Muhammad Tabish Javaid respectively. I was the delegate of ‘Peace’. The first day progressed well as we debated on different motions like root causes of terrorism, role of media in promoting antagonistic relations. We were also provided with the assistance of a research team for the same. During the evening, we celebrated ‘social night’ wherein we got the opportunity to network with other delegates. After this, the delegates gathered and discussed points well past midnight to come up with a joint resolution to be presented the next morning. The aim of forwarding a resolution was to highlight the commonality of thoughts and ideas among Indian and Pakistani youth. The resolution favoured creation of a model organization with cooperation from SAARC nations to help governments on both sides track the activities of non-state actors involved in violence. On the second and last day of the conference i.e. June 5, all the delegates came together to present a joint resolution. We discussed the resolution clause by clause and approved it unanimously with no opposition. It was co-authored by one Pakistani Delegate and one Indian Delegate. In the evening, a prize distribution ceremony was organized to honor the best delegates during the conference. With this the conference came to an end. The saddest part was to bid goodbye to our friends as we headed back to Delhi. All the members of the organizing committee came to see us off at the station. At each and every point during our stay, the organizing committee members took care of us and showed us that they really valued our presence. On our return to Delhi, we stayed there for a day and moved around visiting the city. 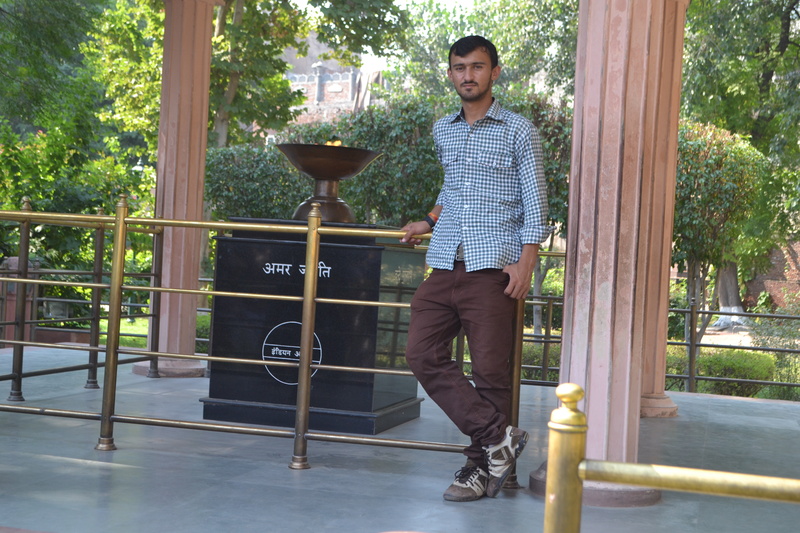 We visited India Gate, Karol Bagh and Chandani Chowk. On our way to the Wagah border, we also had the opportunity to visit the Golden Temple in Amritsar. During our India visit, we interacted with a lot of shopkeepers and they were always happy to have us. They were hospitable, welcoming and their respect for Pakistanis was evident. My India visit gave me a lot of memorable moments and I brought them back with me to Pakistan. Friendship, care, hospitality, love that I received in India is something that I will never forget. Sitting down to write this piece, I wondered what all I learnt from this trip. Everything that happens to us teaches us something good. I have learnt to live life, lead myself to the path of learning, become brave to face challenges and learn how to enjoy the moment that ‘is’. Through discussions at the conference I have learnt how to communicate, every moment with people in India made me feel as if I am at home, smiles of strangers have taught me respect and I am now more convinced that we are one people. Our Indian friends took care of us, they were happy to h ave us. Why? I thought about this repeatedly. I urge the readers to analyze what they see around them before judging others or forming hardened perceptions. When we analyze issues without any barriers in mind, then we know that people across the border are also our friends, not enemies. I am eagerly awaiting a time when all kinds of barriers between India and Pakistan will be done away with and we can visit each other without any formalities. But this is possible only when we talk to each other peacefully. All of us have a moral responsibility to partake in peace building because only then can negative perceptions and hatred be challenged. I am grateful to the entire organizing team of MUN and Aman ki Asha because of whom I am taking back these wonderful memories, to be cherished for a lifetime. 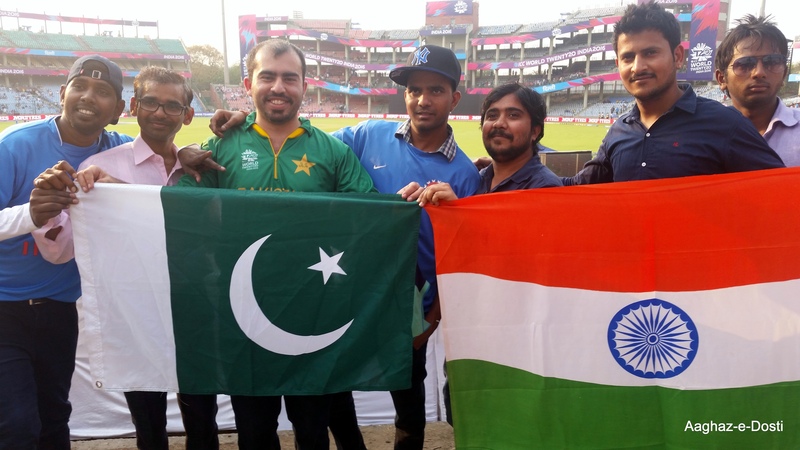 PAKISTAN – INDIA ZINDABAD!!!!! 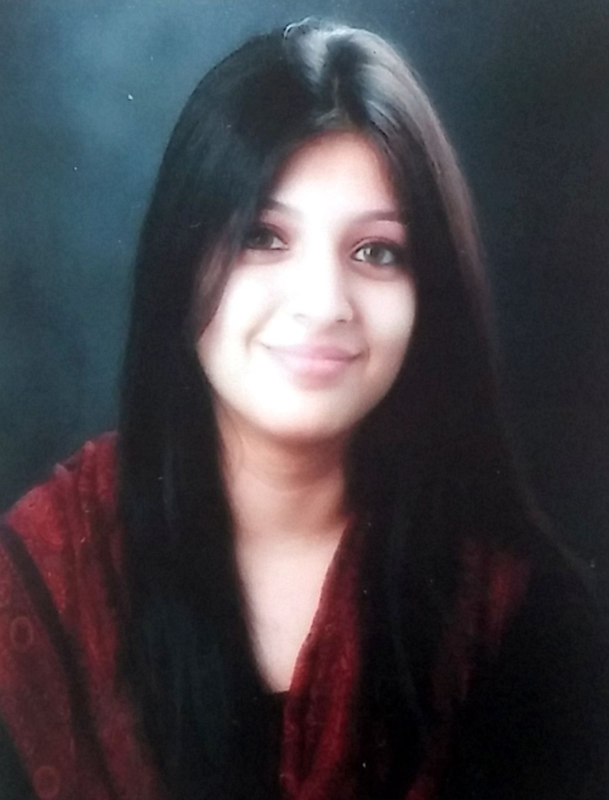 Mehwish Riza is a final year student of Business Administration at Quaid-i-Azam University, Islamabad. 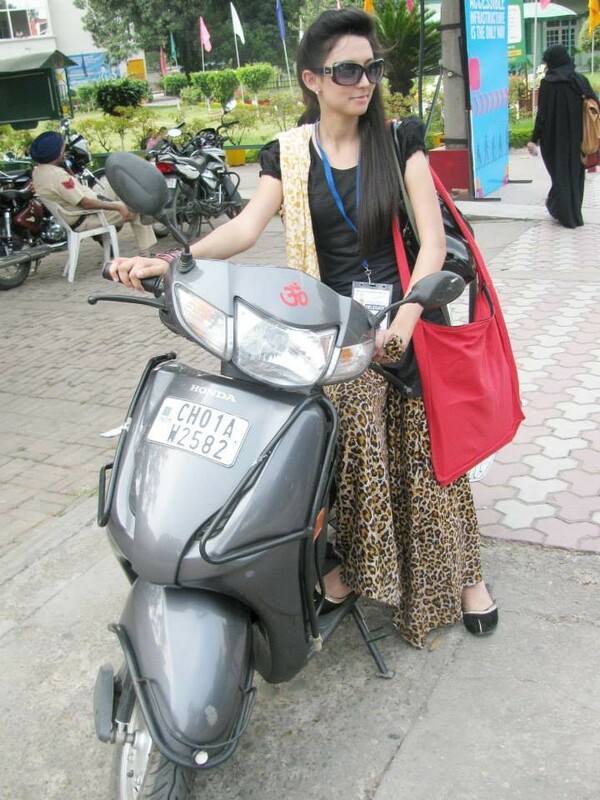 She was a delegate at the second edition of the Aman ki Asha Model UN Council, Nagpur. 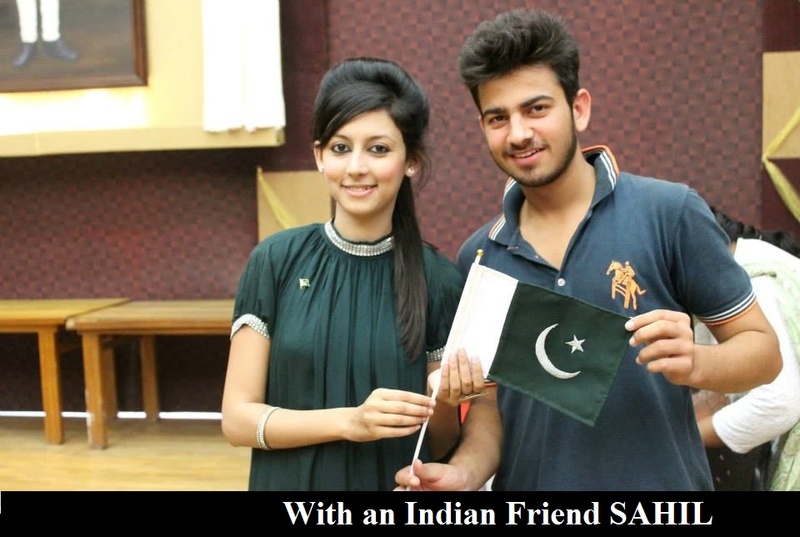 She was a volunteer at the launch of Aaghaz-e-Dosti’s fourth Indo-Pak Peace Calendar. I was travelling to Delhi one day, when I received a rather unexpected call from my friend in Pakistan. He invited me over to visit him, and that was certainly an offer I could not refuse! With no intentions of letting this opportunity pass, I went to Pakistan, enjoyed immensely, and despite the comfortable journey back, returned with a heavy heart. Sudden desires to visit the country across the border are not often fulfilled, and certainly not without hurdles for common men like myself. It was a long struggle to get a Pakistani visa. Even after getting the visa, I was faced with the obvious dilemma about whether or not it was a wise idea to go ahead, since visiting Pakistan is a farfetched idea for the common folk in India, sometimes even frowned upon. Whenever Pakistan is discussed, in whatever context, most Indians are filled with sentiments of hatred and vengeance, as if they have personal scores to settle. Unsurprisingly, many discouraged me, advising me against going there. Some people voiced common misconceptions such as ‘your passport will lose its value’, ‘you will be denied a U.S visa, should you consider applying for one in the future’, ‘both the intelligence agencies will start keeping a watch on you’ and the like. But I was determined to go. I always had the curiosity of knowing more about the life of people on the other side of the border, and it is this curiosity which took me there, thanks to my relatives in Karachi who sent me all the documents required to get the visa. The moment I got the visa, I was very excited about my impending trip. 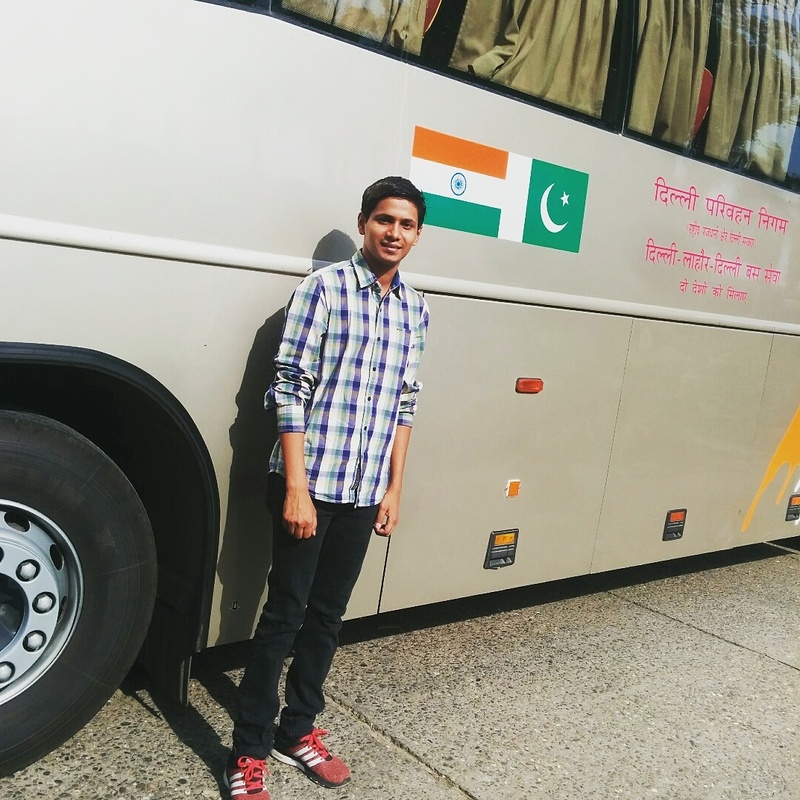 What added to my excitement was the fact that I was going to cross the Wagah border to enter Pakistan, as I opted to travel in a bus instead of an airplane or train. The emotions that are felt when the gate opens at the border and the bus passes through it cannot be expressed in words. After crossing the border, I was in Lahore within a couple of hours. When I first arrived in Lahore, places like Chandni Chowk, Delhi Gate, Ganga Ram Hospital and Shahdara made me feel as if I was still in Delhi. But there were many cultural differences as well – most of the men were wearing shalwar kameez, which I later learned, is the national dress of Pakistan; people were speaking Punjabi, which again took me back to Indian Punjab, but all the sign boards were written in Urdu, which set it apart from Indian Punjab. Soon, I took a train to Karachi because I only had a visa for Karachi. This actually frustrated me because being a mountain lover, I was keen on seeing the Karakoram Range, and also wanted to explore other cities such as Islamabad, Peshawar and Quetta. But on the brighter side, I got more time to explore Karachi, the largest and most populous city of Pakistan. As I arrived in Karachi, I was introduced to the amazing mehmzan nawazi (hospitality) for which Pakistan is popular. People were very warm and welcoming, and were curious to know about India, and especially Bollywood. My uncles took great care of me, while my cousins accompanied me to the different tourist attractions there like Mazar e Quaid – the mausoleum of Jinnah, and beautiful sea beaches. Before visiting Karachi, I had heard a lot about Karachi being similar to Mumbai and I found it to be true when I visited the sea bound areas and huge malls which reminded me of Mumbai. 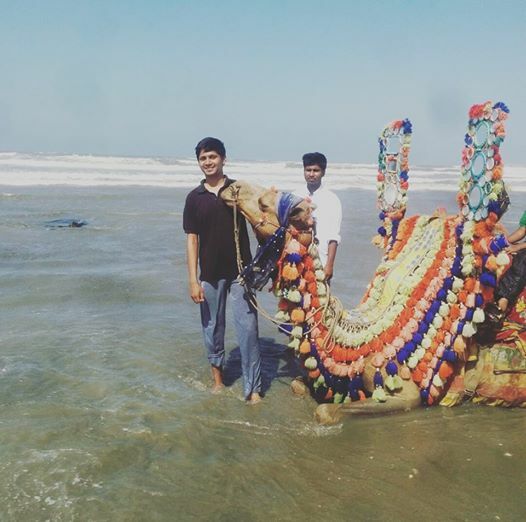 I spent a total of 22 days in Karachi and they passed in the blink of an eye. While I was set to return, my heart felt very heavy to leave my loved ones, because I knew I was not coming back anytime soon, and it could very well turn out to be my first and last visit to Pakistan. But with all the good memories I travelled back to Lahore from where I had to board a bus back to Delhi. 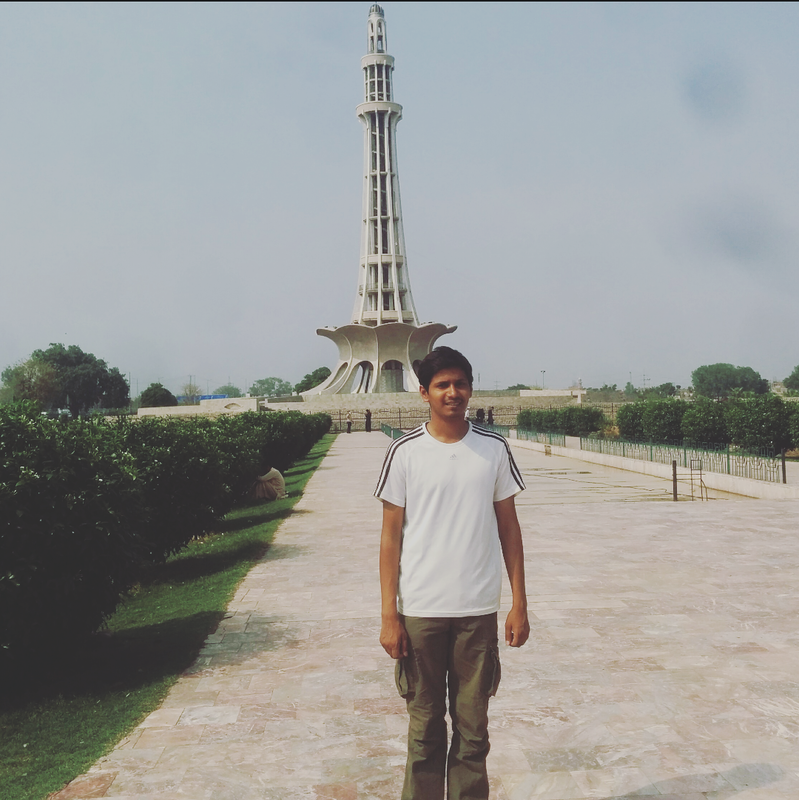 I had one day with me before I had to take the bus, so I made the most of it by visiting some of the famous sites in Lahore like Minar e Pakistan, Tomb of Jahangir, Lahore Fort etc. It was an experience of a lifetime, and after returning from the trip I realized that we need to keep the political differences between the two nations aside. We cannot afford to be swayed by political rhetoric. We are, often by the media and some political actors, brainwashed into believing that Pakistan is an enemy country, without any awareness of the historical background. We need to look beyond the political animosity. I make a very strong appeal for that. The tragedy of the political divide between the two countries is symbolical, and must go. That will never happen until the common people travel to Pakistan and meet the locals, or at least interact with Pakistanis through social media more often. It’s high time we stop spreading hatred, and truly start believing in the philosophy of vasudhaiva kutumbakam, which means the world is one family. Faisal Latif is from Patna (Bihar). 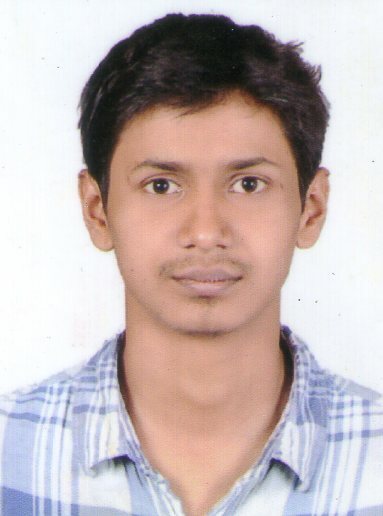 He is currently a student of Department of Travel & Tourism, Jamia Millia Islamia University (Delhi). He had also participated in the ride for peace cycle rally from Delhi to Wagah border. Article: Divided by Boundaries, United through Hearts! I had heard many things about India since childhood. I learnt about my cousins who lived there, their culture, language and stories of the partition narrated by my grandparents to my mother. My mother recalled her visits to India many a times. Even today, she has hope of finding her lost cousins in the land her parents migrated from. She dreams of meeting them someday and silently loves them without their knowledge of it. Around these emotional stories, I spent much of my childhood watching Indian dramas and movies. The first time I learnt about rivalry between two countries was from these very dramas and movies. I was surprised because my mother had never thought about this enmity and hostility. She loved and still loves India. The empty roads during Pakistan-India cricket matches, social media debates that spewed hatred and electronic media’s exaggeration of events between the two countries made me curious to undertake a visit across the border. In 2014, I participated in the Global Youth Peace Festival at Chandigarh with participants from different countries to discuss about and work upon global peace issues. I think I simply lack the capacity to express in words, my feelings of enchantment and bewilderment, the way I felt as I crossed the Wagah border. For me, the border was a mere line that divided the two countries, but as I entered India, I felt closer to my family and relatives, the ones who were always alive in my mother’s memories. Due to an elongated process of security and scrutiny, our arrival to India was delayed. Our beloved khala (meaning ‘mother’s sister’) who was a member of the Festival from India arranged a display of Dhol (traditional musical instrument from the sub-continent) for us. 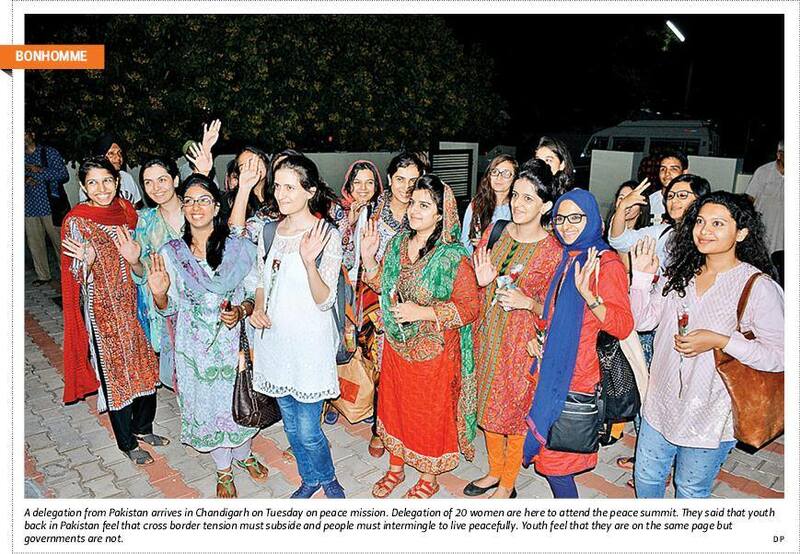 Being a Pakistani Punjabi, I could relate to this enthusiastic style of welcome. However, the traditional Indian welcome of a ‘tika’ (a mark on the forehead, symbolizing welcome to the guest) and ‘aarti’ (traditional Indian style of praying and showing respect to the guest) was new to me. I remembered watching all of this in Indian movies. I recalled seeing a boy touching the feet of an elderly lady and the first word came into my mind was ‘aashirwaad’ (blessings). The media has such a huge influence on our minds. I took an instant liking for people I met as everyone was so hospitable and welcoming. 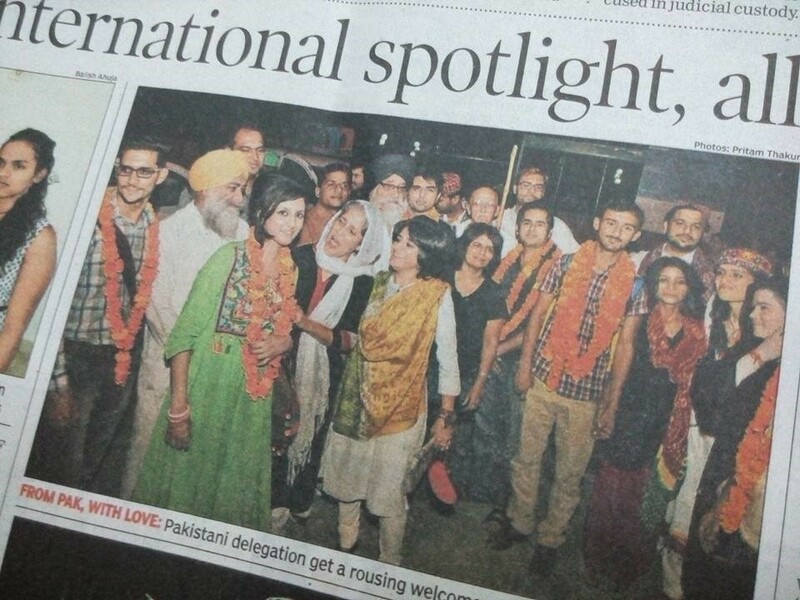 I decided I would try my best to connect to different types of people in India an d on my return to Pakistan; I would spread awareness about the kind of love and respect I received here. This would be a small step in changing perceptions. I immediately started noticing similarities and differences among the cities, style of clothing, culture and language. The neat and clean city of Chandigarh seemed very much like Islamabad while Delhi was a complete contrast. Crowd, tourists and traffic jams were similar to what I saw in Lahore. 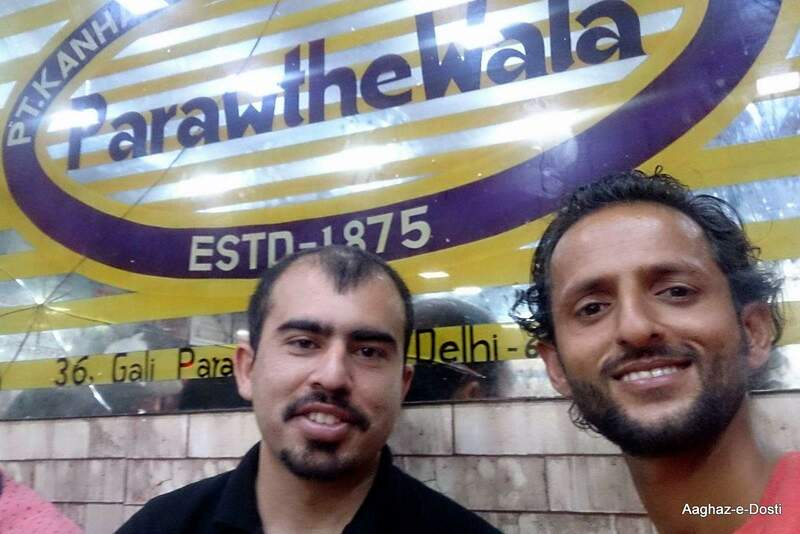 The saree shops (saree is a traditional garment for South Asian women), ‘Parantha’ (traditional sub-continental bread) shops and the visit to Chandni Chowk was a charm. A lot of my friends in Chandigarh conversed in Punjabi and I managed to figure out a few words that were similarly used in Pakistan. All the shopkeepers, people traveling in buses were amazed to meet us Pakistanis. They treated us so well and offered us the best of food and souvenirs as gifts. I saw a lot of mandirs (temples) and gurudwaras (place of worship for the Sikh community). I attended one of the biggest festivals being celebrated at the time. It was called ‘Dushera’. On the roads, I was mesmerized to see girls riding scooters/bikes with their male family member sitting behind them. In Amritsar, it was funny when I demanded salan (gravy) with paratha but the shopkeeper did not understand what I was asking for and kept thinking that I was demanding some kind of salad! It was only later that I realized that he did not understand the term salan. Among the best memories of the visit are the compliments I received from my Indian friends for our dressing, looks and the way we spoke. We were invited by a school to talk about ourselves and our cities. Ironically I am from Lahore and my ancestors were from India and some Indians told me that their ancestors were from Lahore. There were a lot of emotions overflowing when we realized that sacrifices by our ancestors, common issues where we relate to each other had held us together. About the media’s role, I do feel that they overplay issues at certain points, but they also play a role in promoting peace and love. Movies and TV dramas are platforms that have brought Indians and Pakistanis closer. The print media in India positively highlighted participation of Pakistanis in the peace festival that I attended. We were interviewed regarding our views about India and our experience of staying the re. I have watched movies based on the India-Pakistan theme (Veer Zara, Bajrangi Bhaijaan, Khoobsurat etc) and I wish to make a similar movie or be a part of a similar cinematic experience. 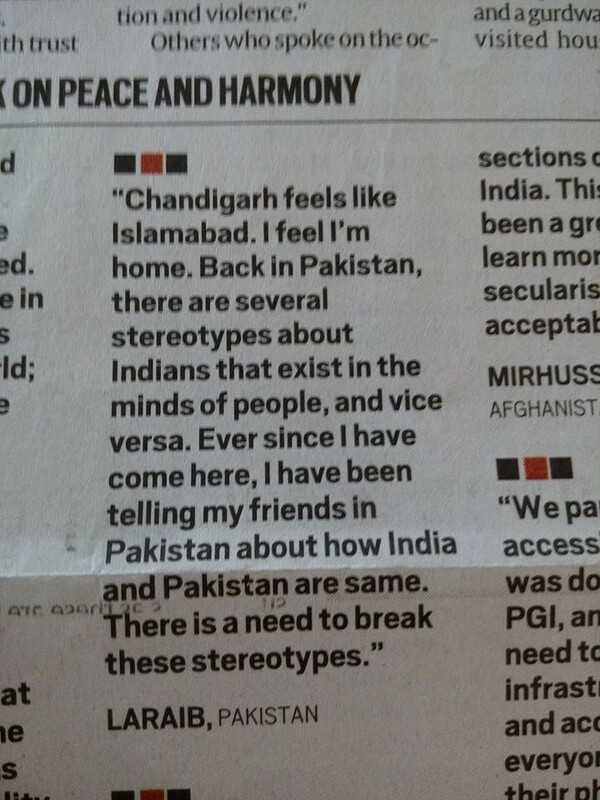 I want to showcase how Pakistanis feel when they visit India and vice versa. How it feels to share a culture, language, food and dressing! How some people are divided by a boundary but not by heart! I have a few cousins residing in India but do not have any contact or information about them. This saddens me. I wish the visa issues, hatred among people and border issues will be resolved with time. I wish Sikh community from Pakistan to have easy access to the Golden Temple in Amritsar and also for the Sikhs from India to be able to visit Nanakana Sahib in Pakistan. 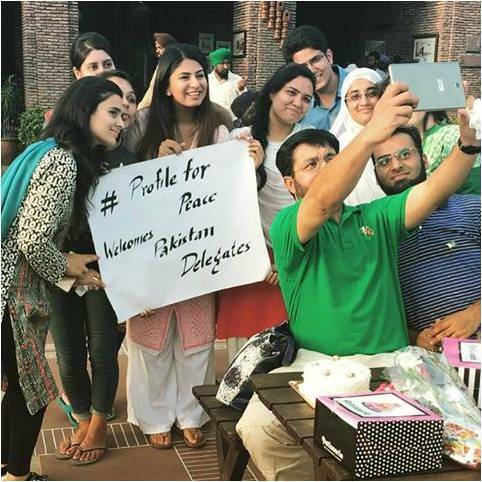 Some of my Indian friends visited Pakistan in 2015 and playing host to them was an amazing experience for me. Nobody could recognize them as Indians here for they looked so similar to a common person in Pakistan. During a cultural exchange program in the United States (2014), I spoke in Hindustani (mix of Urdu and Hindi) with an Indian student and a lot of people were amazed at how we understand each other’s language despite being from two different countries. When I participated in a program in Denmark (2016), many people greeted me wit h ‘Namaste’. I think this is because our culture is very similar, be it the bright colors, delicious food or similar skin complexion. I feel connected to India despite all the rivalry that is so deeply institutionalized in the systems of both countries. I met Muslims, Hindus and Sikhs in India. 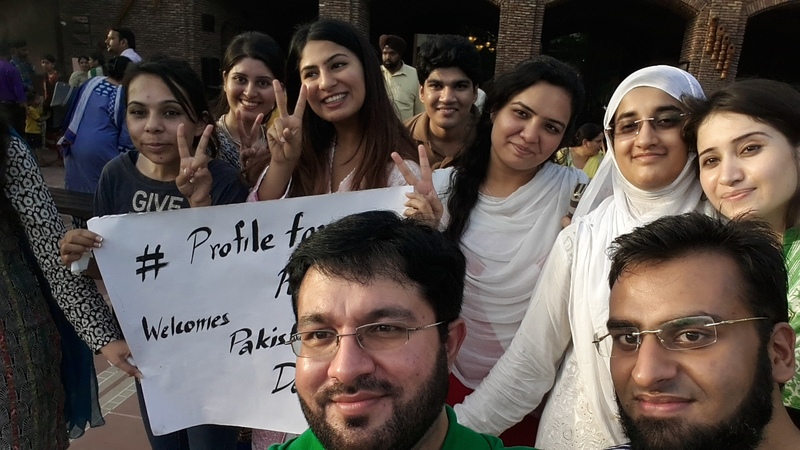 Being a Pakistani, it was amazing to meet people from different faith backgrounds. There are people with different perspectives living in every society. I met Indians who are passionately working for cross-border peace, like their counterparts in Pakistan. I feel that war, hatred and bloodshed will never usher in any peace or love. During my India visit, I met enemies who were hospitable and loving! I never knew enemies could be that way. If those that I met were enemies, then I wonder how would friends be like! 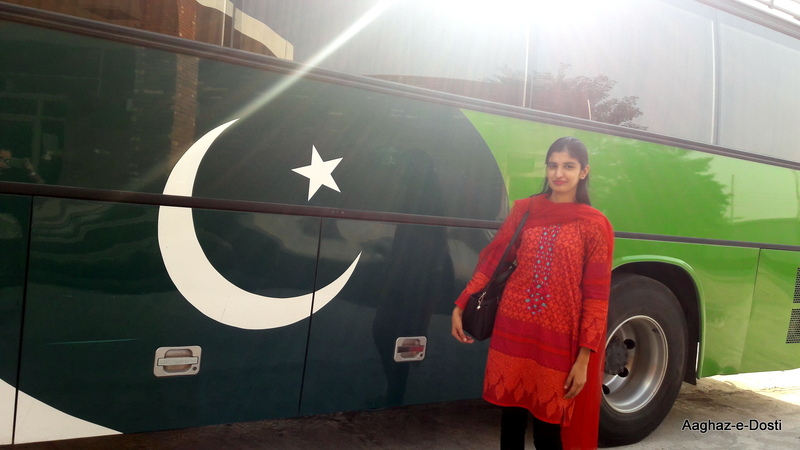 Laraib Abid is a youth leader, social and women’s right activist from Lahore. 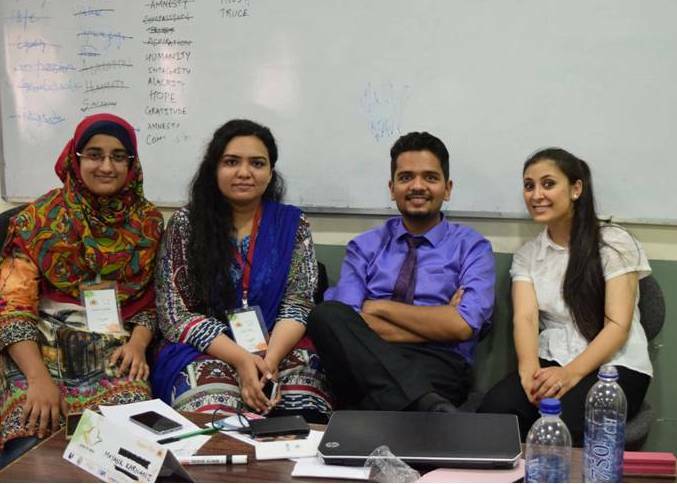 She is currently pursuing M.Phil in Gender Studies from University of Punjab, Lahore Pakistan and working as a National Program Manager in an NGO. She has been a cultural ambassador in USA for an exchange program. I remember the first time I went to the Wagha Border. It was in 8th grade when the guards on both sides marched and saluted for a huge round of applause as we waved to the neighbours on the other side, maybe a three minutes walk away. Back at 13, I was most passionate about traveling and adding the number of countries on ‘The List’. I remember asking the Indian guard in uniform if I can stamp my feet a few times so I could go home and tell my mom I went to India today? He kept a straight face to my ludicrous request and just nodded. I remember staring and even holding onto the golden brown sand. I was this close to India. Since I have a typical Lahori background with no great grand fathers from Lucknow or Chandi Chowk I thought this was as close as I could get. Back in the day, I had dreamt of London and resonated it with English classics of L. M. Montgomery and L. M. Alcott and I would think of Paris and it’s larger than life architecture and aristocracy, mapping it out in my head with a vague schema of what these places would feel like. However, when it came to India I could never really decide what that experience would be despite watching endless Bollywood movies. First of all, it was so big. And it was similar. But also a bit different. Hence, I concluded India was a place that could only be experienced and not just be boxed like all other countries. It seemed to have more depth to it. Or maybe more of it that I could decipher because I shared a language, lots of customs and social issues. As there was a lot more of what I could understand, there was a much greater desire to visit the land. And one day, out of no where, in 2008, a friend from college came up with a brochure and asked me if I would like to apply for the Third International Youth Peace Festival being held at Chandigarh. I filled in the form, almost sure I would not get the visa but against all odd got it. And that’s when it hit me. I was no longer going to wave across Wagha, I will be crossing it. I remember jumping and skipping through the road that connected the two countries a few miles apart. Two offices and stamps later, there stood one of the kindest, most gracefully dressed woman I have ever met holding carnation-flower necklaces to greet me with. She hugged me. And I will never forget that hug. It was the same hug that my father gave me seven days later when I returned to Lahore. This was it. This was India. This was warmth. And this was courage. The welcome I received at her school in Amristar was one I will never forget in a lifetime. The kids and their songs and the teeka and the pooja – to cut it short, let’s just be filmi and say I got to see first hand what Amitabh Bachan says in Veer Zaara ‘Humare Yahan Mehman Bhagwan Hota Hai aur Tum toh Pakistan se ayi ho’. This was followed by a five hour ride to Chandigarh where all of us clapped and sang to the evergreen subcontinent music. The programme organized by Pramod Sharma Jee of Yuvsatta was one of the first in South Asia to bring together the youth of South Asia for a dialogue. There were performances and debates and a day trip around the mesmerizing and versatile Rock Garden. We all knew we were going to make friends but the depth of the friendship we were able to achieve in a matter of four days is something I still am not able to explain to myself. There was an instant connection, not because of the language or the shared love for theatre and Bollywood but an inexplicable heart to heart connect which as dramatic as it sounds made all of us shed a few tears as we parted ways. Shayan Khan is a researcher and lecturer of consumer behaviour, marketing and strategy with a love for food, travel and books. 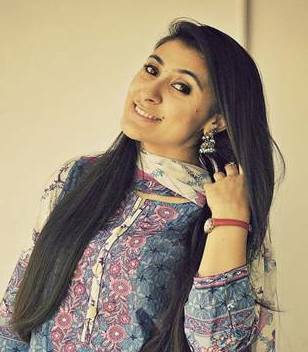 She is a member of the Lahore chapter of Aaghaz-e-Dosti and also an alumni of Global Youth Peace Festival, Yuvsatta. 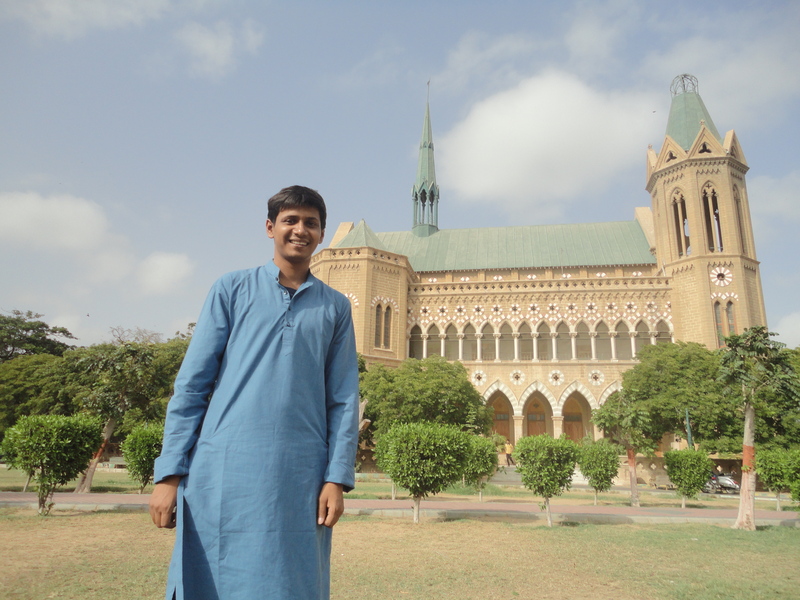 Shayan lives in Lahore, Pakistan.